The firstof a new breed of commercial rockets built by the firm SpaceExploration Technologies (SpaceX) is getting a workout at its Florida launchpad. 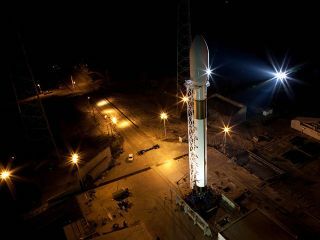 TheHawthorne, Calif.-based SpaceX raised its first Falcon 9 rocket into a verticallaunch position on Saturday at Florida?s Cape Canaveral Air Force Station tobegin tests that the firm hopes will set the stage for an inaugural liftofflater this year. The Falcon 9 was hauled back down on Monday as SpaceX pushesthrough launch preparation paces. ?The rocketwas lowered today, but we will be going vertical again later in the week todemonstrate operational responsiveness and to collect additional data fromvehicle instrumentation,? SpaceX spokesperson Emily Shanklin told SPACE.comMonday. The newFalcon 9 rocket is the launch vehicle of choice for SpaceX?s planned Dragon spacecraft,which the firm is building to haul NASA cargo to and from the InternationalSpace Station. But SpaceX is also building the Falcon 9 to launch payloadsspaceward for other customers. Engineers finishedassembling the rocket at the launch site on Dec. 30, then built its launchsupport structure to raise the booster last week, hitting each milestone a dayor two early. "Thisentire process has helped us validate key interfaces and operations prior toexecuting our launch campaign with the vehicle in its final flightconfiguration," said SpaceX CEO Elon Musk in a statement. "Weencountered no show-stoppers or significant delays. I am highly confident thatwe will achieve our goal of being able to go from hangar to liftoff in under 60minutes, which would be a big leap forward in capability compared with the daysto weeks required of other launch vehicles." SpaceX?sFalcon 9 rocket is a booster designed to launch the Dragon spacecraft and othermedium-sized payloads from Space Launch Complex 40 at the Cape Canaveral AirForce Station. The two-stage booster stands 180 feet (54.9 meters) tall and is17 feet (5.2 meters) wide at its widest point. It took SpaceX workers about 30minutes to haul the Falcon 9 booster into launch position on Saturday. "Any engineeredsystem has requirements that can only be recognized through actual assembly ofreal hardware," said Brian Mosdell, SpaceX?s director of Florida launchoperations. "This rapid integration and stand-up provided our engineersand technicians with invaluable insights that will greatly streamline ourefforts towards the first Falcon 9 launch in 2009." The first Falcon9 rocket could make its launch debut by spring, SpaceX officials have said. Thefirm successfully test-fired the booster?s first-stage rocket engines last yearto check their performance for their full flight duration. SpaceX also celebratedthe first successful launch of its smaller Falcon 1 rocket in September2008 after three failed attempts. SpaceX hasfive Falcon 9 launches slated for 2009. Those missions include a debut launchsponsored by a U.S. government customer which the firm is not naming, as wellas two demonstration flights for NASA?s Commercial Orbital TransportationServices program. NASAawarded SpaceX a $1.6 billion contract last month to launch 12 cargo missionsto the International Space Station through 2016. SpaceX is one of two firmsthat nabbed the cargo contract. Orbital Sciences Corp., of Dulles, Va., was theother firm and pledged to launch eight cargo flights for $1.9 billion.